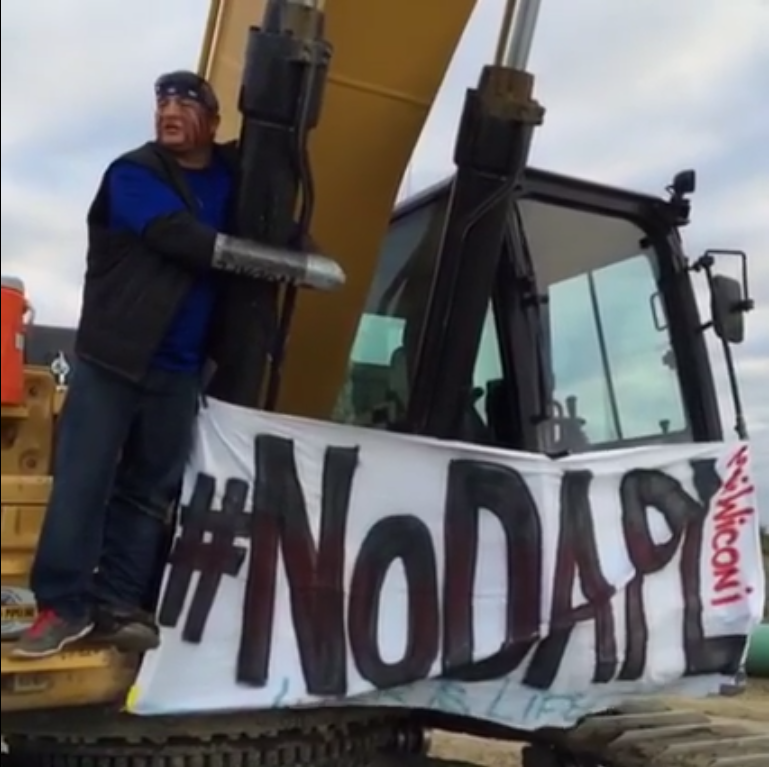 Morton County, ND – Early in the morning of Wednesday, September 14th, indigenous water protectors again disrupted Dakota Access Pipeline (DAPL) construction by entering a work site north of Almont, North Dakota and using lockboxes to attach themselves to machinery. Livestream videos posted to Facebook shows three people attached to construction equipment with lockboxes. One video shows the man streaming being arrested as the stream cuts out. Another local corporate news Facebook video stream shows the lock down in progress as North Dakota Highway Patrol and sheriff’s deputies make arrests. Wednesday’s lockdown actions against DAPL come on the heels of similar disruptions on Tuesday, which stopped work for the day on two different pipeline sites. At least 20 people, including two Unicorn Riot journalists, were arrested during Tuesday’s actions by militarized police wearing riot gear, some of whom brandished automatic weapons. Tuesday also saw over a hundred #NoDAPL solidarity events across the country and the world during an international day of action. In a press release issued about “illegal protest activity”, Morton County Sheriff Kyle Kirchmeier announced increased charges against people who locked down during Tuesday’s actions, as well as felony charges against some of the people involved in the direct action on Wednesday. Three water protectors who locked down, each face felony reckless endangerment charges, and two others accused of aiding in the action face “conspiracy to commit reckless endangerment”, also a felony, as well as misdemeanor charges. Today’s escalation of legal charges brought against water protectors resisting Dakota Access construction comes almost a week after North Dakota Governor Jim Dalrymple activated the National Guard to operate a road checkpoint near anti-pipeline campsites. In a press conference held last Thursday, Governor, North Dakota National Guard Major General Al Dohrmann, Morton County Sheriff Kyle Kirchmeier, and North Dakota Highway Patrol Colonel Mike Gerhardt announced their intention to identify anti-DAPL “agitators” as well as saturate pipeline construction areas with patrols in order to more effectively locate and arrest water protectors. The state of North Dakota has reportedly spent almost $2 million on mobilizing law enforcement against indigenous water protectors, and Governor Dalrymple has asked the federal government provide funding and personnel to assist in protecting pipeline construction. The North Dakota Office of Emergency Services has also requested a loan of $6 million from the Bank of North Dakota to “offset costs for providing assistance to local law enforcement” related to pipeline resistance, according to the Bismarck Tribune. Unicorn Riot will continue to cover the struggle Dakota Access Pipeline and bring you more information as best we can.